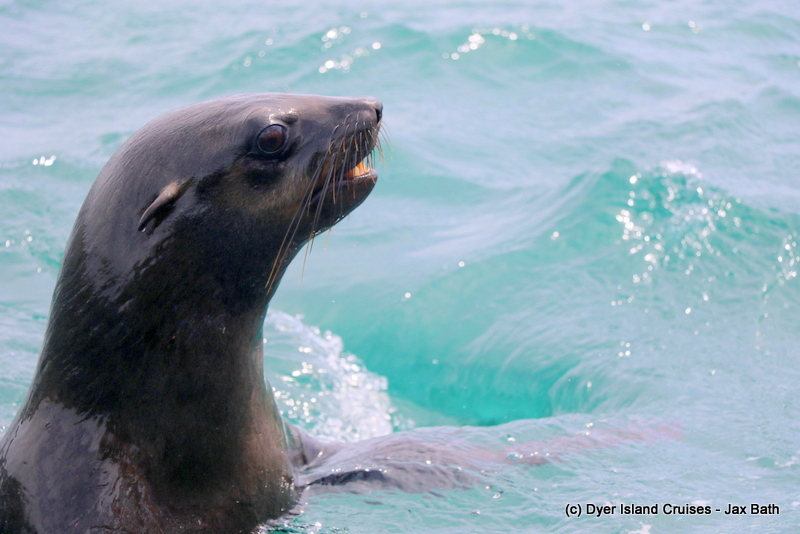 Today was a very special day for all of us here at Dyer Island Cruises. We are so much more than just an eco tour company, and we’re very passionate about giving back to the incredible eco system that we find ourselves working in every day. 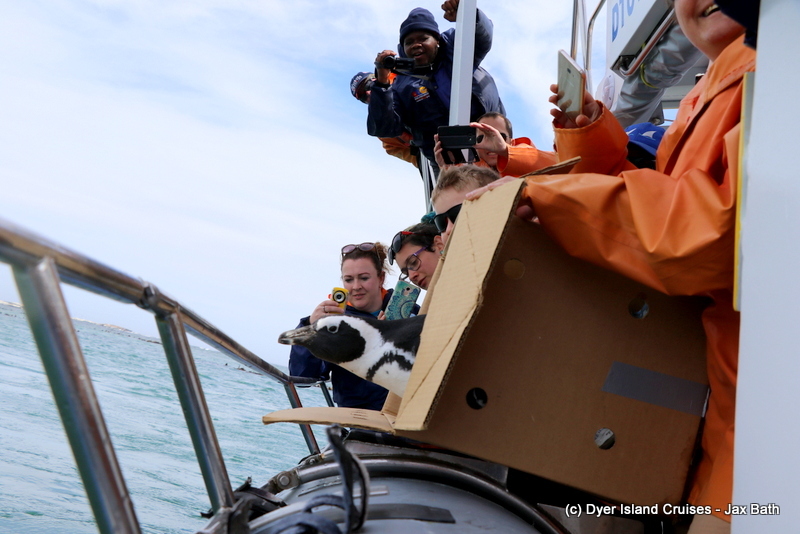 Sometimes, this means picking up litter on our tours but when we’re really lucky, we get to give an African Penguin or two a one way ticket back to Dyer Island. 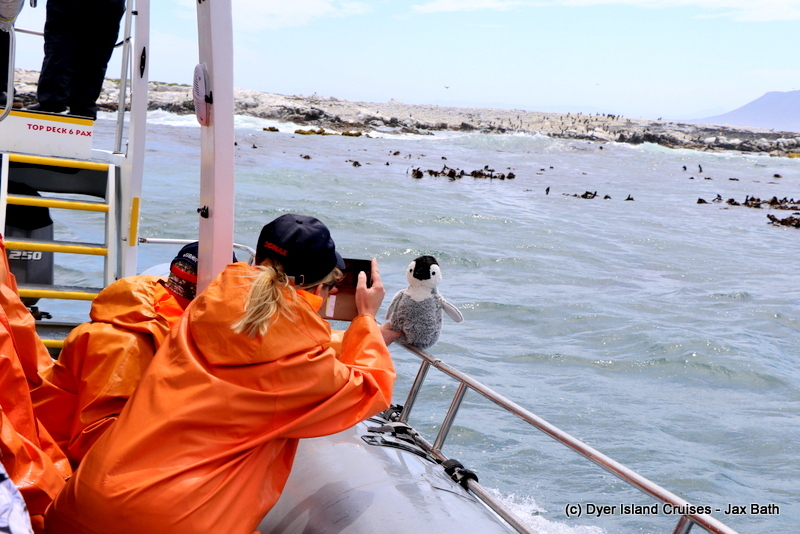 A penguin release is always the highlight of any tour, and today we were lucky to have two little penguins jump on board for a ride home. We started off our tour, business as usual, we cruised up The Shallows and over to The Clyde Reef System, picking up some Sea Bamboo and taking about the importance of kelp in a cold ocean system. 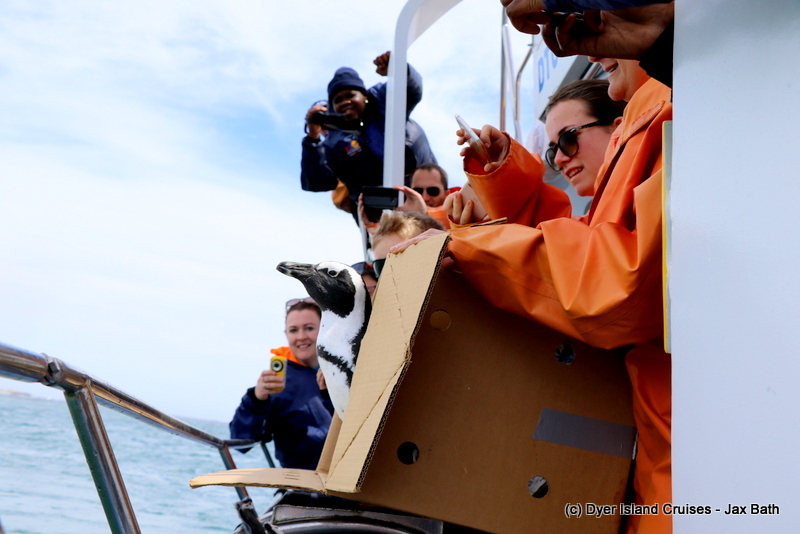 At about this time, the penguins seemed to sense that they were close to home, doing some braying from inside their rescue box. This braying noise is how they got their previous name, which was the “Jackass” Penguin. 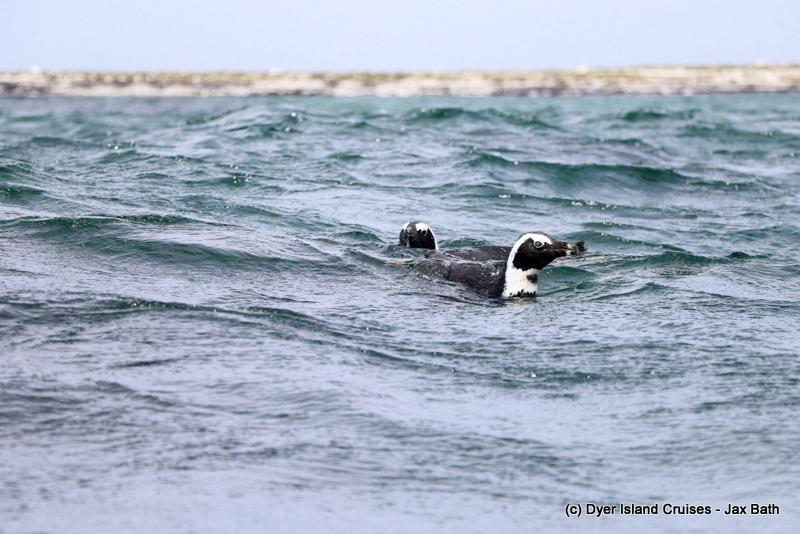 This name doesn’t really have the best ring to it, so years ago it got changed to the African Penguin, as it is the only endemic penguin species found along our coastline. Today, our African Penguins are very endangered due to habit loss, egg collection and overfishing, so we try to do our little bit for the birds on our island by providing a safe haven in the form of our African Penguin And Seabird Sancutary. Sick, oiled or injured birds are taken into our care and released as soon as they are well enough. 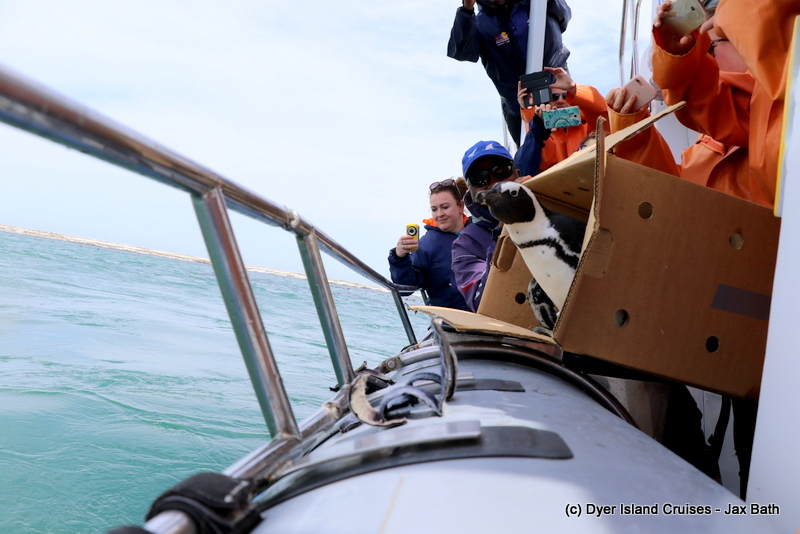 By the noises coming out of the box, we assumed that these penguins were perfectly well, so we made our way to the front of Dyer Island, where they would be given some time to hop out the box and into the Atlantic. 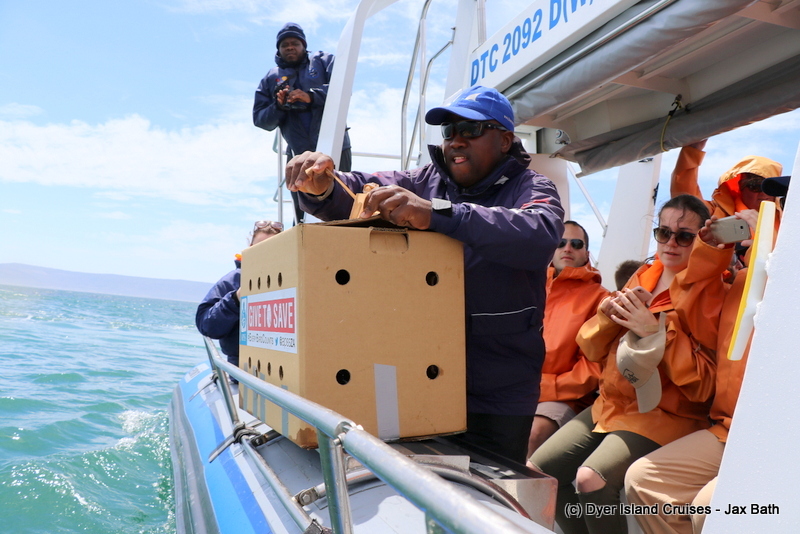 When we arrived, Kira opened up the box and faced it towards the island, but it seems as though our birds were looked after so well at the sanctuary that they did not want to go. After some time, they warmed up to the idea, having a look out the box and scoping out the environment around them. Ironically, the penguin who showed the most curiosity was the last out the box, with the other clumsily plopping into sea a few minutes later. 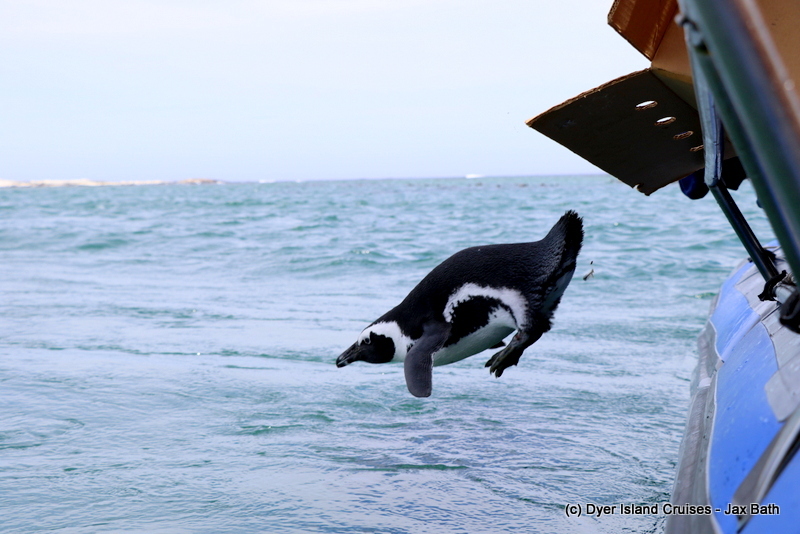 Once he realized that his friend had gone, the second penguin decided that he better join in on the fun, free falling into the water and meeting up with hi friend. 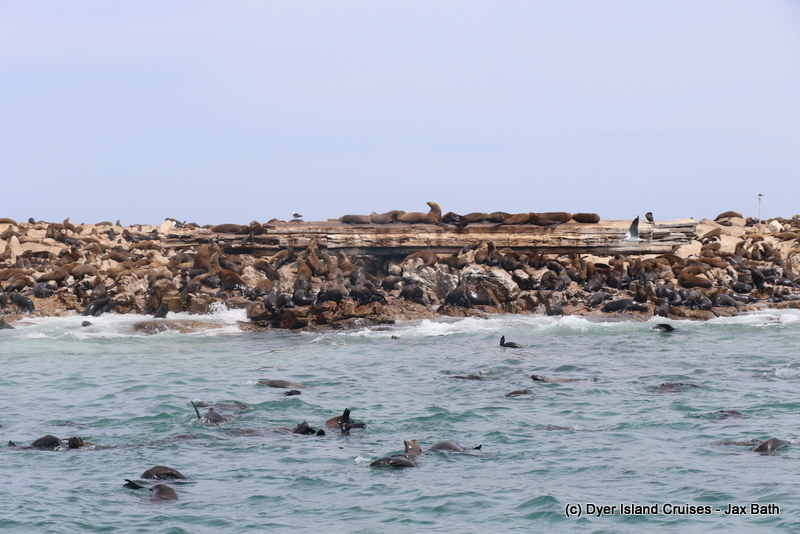 After this awesome event, we moved on towards our seal colony for more of that feel good animal watching. 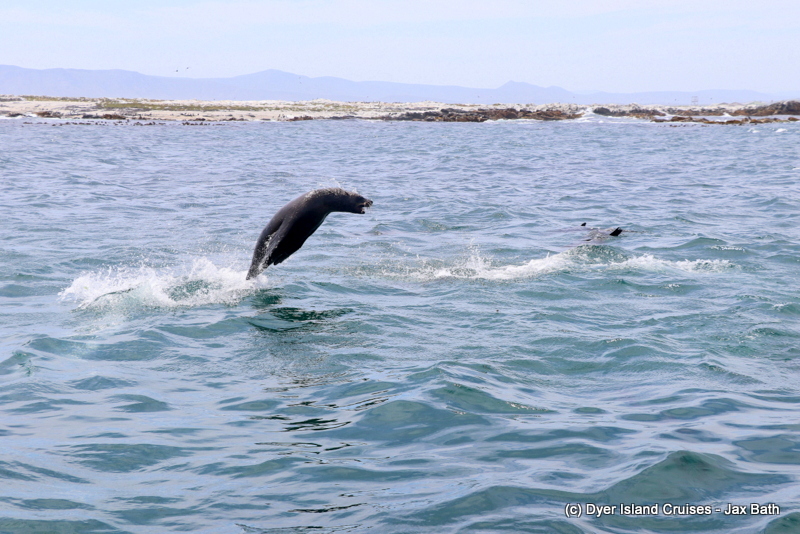 The seals definitely obliged us, jumping out the water like there was no tomorrow. 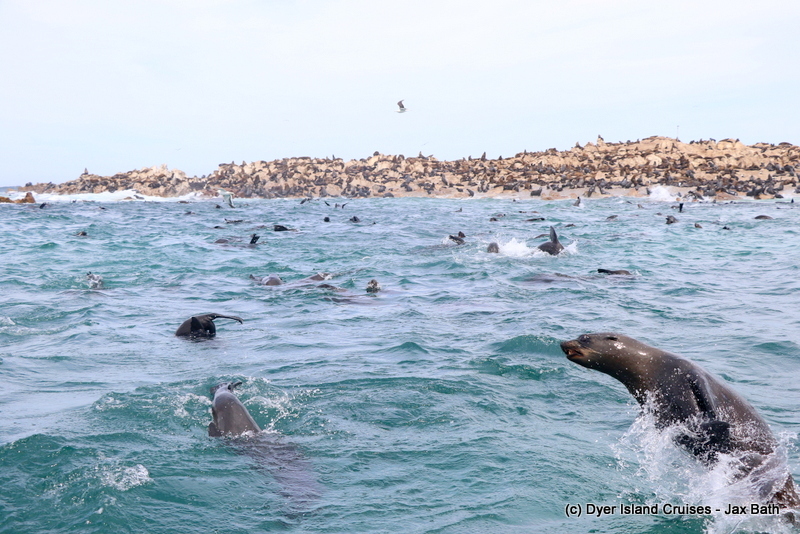 They all seemed to be playing and jumping, and we watched in awe as these pinnipeds leaped out the water, showing off and then crashing back into the sea. 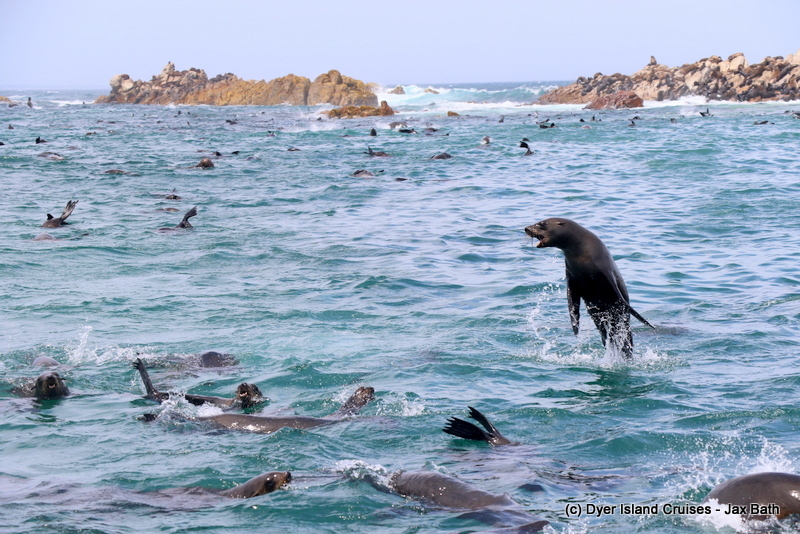 we cruised up and down Shark Alley for ages, watching as these seals would group up and start with their tomfoolery. 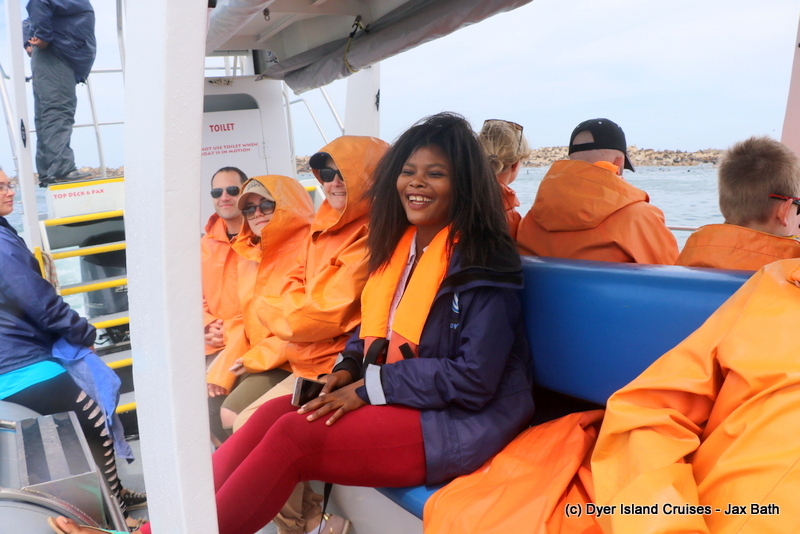 We finished off our tour by travelling through The Shallows and back to Kleinbaai Harbour. At first, the birds were a little hesitant, but eventually warmed up to the idea. Sussing out the salty air. This little bird was a little more cautious than his feathered buddy. Our two little success stories with Dyer Island in the background. A Penguin on a school trip from Austria. The seals were jumping like there is not tomorrow. We had hundreds of very playful seals in the water. The Prince Port, which wrecked here in the 1800’s. A cheeky seal checking us out.